Two weeks ago, on 20-21 December 2013, sixteen teams were the main attraction at the DARPA Robotics Challenge (DRC) Trials, where they demonstrated their prototype robots’ ability to perform a number of critical real-world disaster-response skills. After two days of competition, the agency selected eight teams to receive up to $1 million in funding to continue their work and prepare for upcoming DARPA Robotics Challenge (DRC) Finals. Engineers from Sandia National Laboratories will demonstrate real-world robotics successes at the DARPA Robotics Challenge Trials 2013 Expo this week (20-21 December) in Florida. The challenge is focused on human-scaled robots that assist in humanitarian aid and disaster response. Sandia engineers will demonstrate the Gemini Scout Mine Rescue Robot, which was designed to overcome dangers lurking in a mining accident: poisonous gases, flooded tunnels, explosive vapors, and unstable walls and roofs. Such potentially deadly conditions and unknown obstacles can slow rescue efforts to a frustrating pace. Four teams that built full robot hardware and software systems using their own funds qualified to join thirteen other teams to compete in the Defense Advanced Research Projects Agency (DARPA) Robotics Challenge (DRC) Trials. The event will take place 20-21 December at the Homestead-Miami Speedway in Homestead, Florida, where spectators can observe as the robots are tested on the capabilities that would enable them to provide assistance in future natural and man-made disasters. Seventeen teams will be directing their emergency-response robots to perform eight basic tasks which were drawn from the Fukushima Daiichi response and then converted into standardized tests by researchers at the National Institute of Standards and Technology (NIST). A year later, the capabilities of robots that qualify in this year’s trials will be tested in a more realistic disaster scenario. In the winner-take-all finals, robots will perform all eight challenges consecutively. NIST engineers have been at the forefront of using standardized performance testing for emergency response robots used in bomb-response and for urban search-and-rescue operations. Since 2005, fifteen NIST tests have been adopted as standards by ASTM International, and about forty more are under various stages of development or review. The U.S. Naval Research Laboratory’s (NRL) Acoustics Division, with Bluefin Robotics, executed a record setting 507 kilometer (315 mile), long-endurance autonomy research mission using its heavyweight-class mine countermeasures autonomous underwater vehicle (AUV), Reliant. NRL’s Reliant AUV, when equipped with a low frequency broadband (LFBB) sonar system, is perhaps best known as the prototype for the new U.S. Navy Knifefish mine-hunter. Researchers have identified some of the underlying physics that may explain how insects can so quickly recover from a stall in midflight — unlike conventional fixed wing aircraft, where a stalled state often leads to a crash landing. The analysis improves the understanding of how insects fly and informs the design of small flying robots built for intelligence gathering, surveillance, search-and-rescue, and other purposes. By 2021, Ann Arbor could become the first American city with a shared fleet of networked, driverless vehicles. This is the goal of the Mobility Transformation Center, a cross-campus University of Michigan initiative that also involves government and industry representatives. In 2011, at Carnegie Mellon University, President Barack Obama announced the National Robotics Initiative. The National Science Foundation announced it has awarded a total of more than $7 million to Carnegie Mellon researchers in the latest round of grants for the initiative — a multi-agency effort to develop robots that can work with humans to extend and augment human skills. Researchers are developing robots for bridge inspection, mine rescue, and aid for the blind. Snakes usually travel by bending their bodies in the familiar S-pattern. When they are stalking prey, however, snakes can move in a straight line by expanding and contracting their bodies. This “rectilinear gait” is slow, but it is quiet and hard to detect—-a perfect way to grab that unsuspecting rodent. 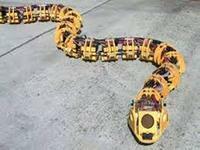 This “limbless locomotion” is a highly effective way for a robot to move through cluttered and confined spaces. Today’s naval forces rely primarily on highly capable multifunctional manned platforms, such as ships and submarines. Even the most advanced vessel, however, can only be in one place at a time, making the ability to respond increasingly dependent on being ready at the right place at the right time. New Hydra program aims to make it easier, faster, and cheaper to deploy crucial capabilities worldwide. Researchers develop novel robotic scouts that can help firefighters to assist in residential and commercial blazes. The robots will map and photograph the interior of burning buildings by using stereo vision. Working together both collaboratively and autonomously, a number of such vehicles would quickly develop an accurate augmented virtual reality picture of the building interior. They would then provide it in near real time to rescuers, who could better assess the structure and plan their firefighting and rescue activities. A Korean research institution joins with nine U.S. universities to enter the team’s DRC-HUBO, a humanoid robot, in DARPA Robotics Challenge (DRC). The competing robots will have to fulfill eight tasks at the competition, among them driving a utility vehicle, walking across rough terrain, climbing a ladder, and using hand tools. The day may not be too far away when homeowners can schedule monthly tick clearing service, drastically reducing the risk of tick-borne illness in their pets and children. This is because the “tick rover” robot has just cleared a major hurdle. Testing last month indicated unequivocally that the device kills between 75 and 100 percent of the ticks in its path. Student-built autonomous underwater vehicles will speed through the depths of a Navy pool in a battle for supremacy at the 16th International RoboSub Competition. The competition is being held this week (22-28 July). In addition to building autonomous underwater vehicles, teams are also responsible for creating Web sites and writing journal papers that outline their work.